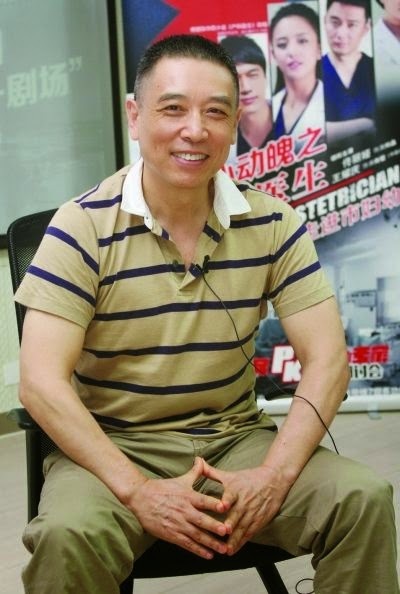 Writer Zhang Zuomin is proud of his new TV series "The Obstetrician" which airs tonight on Jiangsu TV. He says it is different from the usual medical soap operas focused on romantic liaisons in the hospital - this one is authentic and focused on the medical cases and technical details, he says. Zhang isn't a doctor but he says the dialogue is authentic based on his experience of working in a hospital as a security guard before he went to Fudan University to study Chinese. He says the TV series focuses on real medical cases and is realistic down to the drug doses used and the medical procedures as described in the medical journals. When working in a hospital Zhang said he noticed that doctors have their own jargon, quite unlike the official language used in textbooks. He has adopted this in the script and says he wanted to show the real day-to-day working life of doctors rather than focus on trivial affairs and melodramatics. Zhang says he became frustrated watching other medical TV dramas on TV as they were phoney. To add extra authenticity he got a doctor friend to review each script and make suggestions. The drama and tension comes more from the conflicts in the medical cases, although the relationships between doctors are also important as they often have different approaches and opinions on medical cases, he says.